This is the book that Mary Ellen Bickford, Jim Peterik and myself wrote in 2002. My name is not on the cover because the publisher would only allow three authors' names. However, I wrote one-third of the first edition of the book, as well as the initial plan submitted to the publisher. The first edition sold over 67,000 copies and is a very popular reference for songwriters here in Nashville where we live, and all over the USA. The second edition is now in print and both Mary Ellen and my names have been removed from the cover as we did not participate in the revisions made to this edition. This book gave me the excuse to dive into a very professional and through study of the popular song literature. By 2006, I had composed a number of songs which Mary Ellen and I recorded in our album "Songs of Love and Joy." The study of popular song is a fascinating one and an important one for young composers. Over a two-year period, I analyzed a great many popular songs. 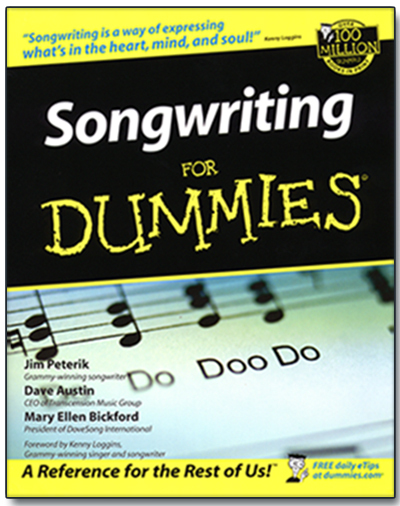 The iUniversity intends to publish a volume on advanced songwriting based on my work.